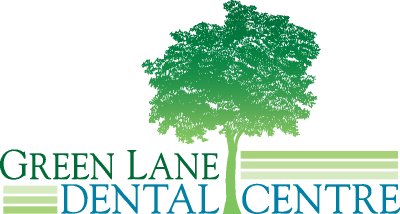 If you are looking for a practice which can offer you everything you need in terms of dentures in the South East London area then look no further than us. For many, dentures can make the difference between struggling to eat or talk comfortably, and eating and smiling naturally. From traditional, full removable dentures, to dentures that look and feel like your natural teeth because they are completely supported by dental implants, Dr. Max and his team will expertly find the right combination to fit you with a new, perfectly comfortable smile. If you need dentures or think that you might, now is the perfect time to come in for a complimentary consultation with Dr. Max. All of our dentures are custom-made using quality materials that look natural and are durable. We ensure that they are the right shape, color, and size for a natural look and that the bite (the way your teeth come together) is correct. There are various types of dentures available, including dentures which are made more stable by the use of implants, and we will recommend the type that will work best for your mouth, your expectations, and budget. We can also solve denture problems you are experiencing, and can do many repairs and relines on the same day, right here in our office. If you require extractions, Dr. Max or Dr. Masih will fit you for immediate dentures. Immediate dentures are a temporary set of teeth pre-fitted to your mouth prior to tooth extraction so that they can be inserted immediately following the procedure, while your gums heal. Immediate dentures have many advantages, not the least of which is never having to go without a set of teeth. Complete dentures are full replacements for all of your teeth. This can be a full set of either upper or lower teeth or a combined set for your entire mouth. Partial dentures are designed to correct the gaps in your smile when only some of your teeth are missing. 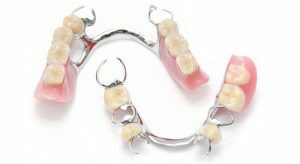 Metal attachments anchor the dentures to your natural teeth. Partial dentures maintain tooth alignment by preventing your remaining teeth from shifting. Partial dentures can also help you prevent further tooth loss due to decay or gum disease. Flexible dentures are an alternative to a traditional pair. Here’s what you need to know and if you should ask your dentist about this option. Over time, people can develop problems with dentures. They can become loose, painful or tend to slip or move around. Dr. Masih and his team can prevent these problems by creating a custom set of dentures for you that will stay put. 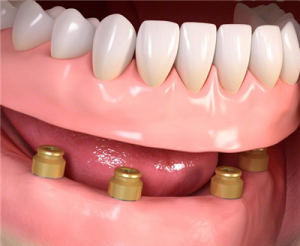 They are attached to and supported by dental implants. Dentures supported by implants can provide you with chewing confidence and can prevent bone loss. When your own roots are still available, overdentures are preferred because when you retain your tooth roots, you can prevent bone loss in your jaw. Bone loss can also be prevented through the use of dental implants, either to support a full or partial denture or to replace individual teeth. Full or partial removable dentures can also be made of high-quality materials that fit comfortably, work well, and stay easily in place. Dr. Max understands that whichever option you choose, it is of utmost importance that care be taken to ensure the most accurate fit possible, that the teeth chosen for your denture are appropriate in terms of shape, color and size so as to look natural, and that the bite (the way your teeth come together and function) is made in such a way that you can eat comfortably. When all these things are accomplished, you can have dentures that look natural and feel comfortable. 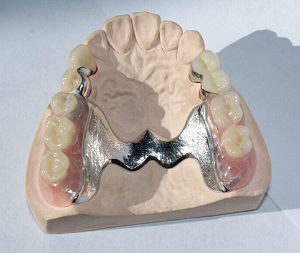 Full and partial dentures are custom-crafted using the highest quality materials. Because your dentures are made just for you, they will look natural and the bite will be correct. Whether you need full or partial dentures, come in and see Dr. Max Pura or Dr. Masih Sage for a complimentary consultation. If you’re missing teeth and considering dentures, be sure to ask Dr. Max Pura about dental implants. Dental implants feel and function just like your natural teeth and are a popular alternative to removable dentures. They are permanent replacement teeth that are affixed to titanium posts anchored into the jawbone. Read more about Dental Implants here. Typically, removable dentures need to be replaced every 7 to 15 years, compared to an average 25-year life span for dental implants. Dr. Max can go over the pros and cons of dentures and dental Implants with you and recommend the solution that will work best.